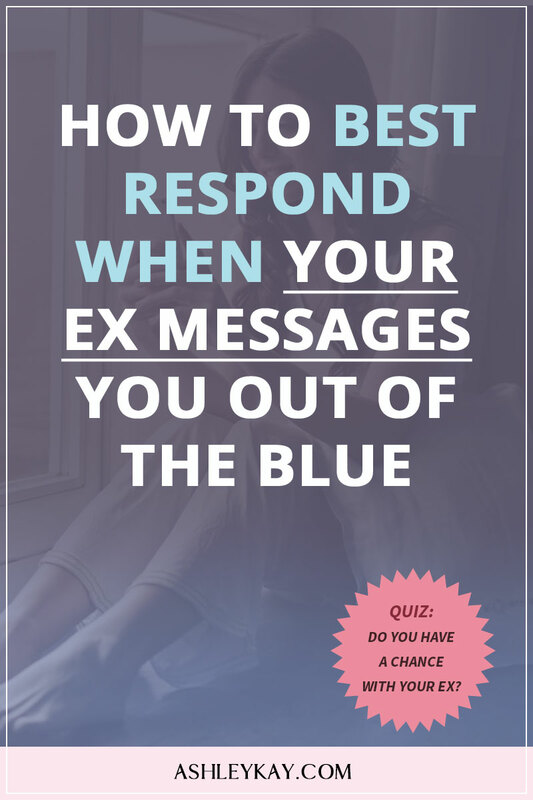 Do you know what to say if your ex was to contact you out of the blue? A lot of people unknowingly “screw things up” because they weren’t prepared for the surprise message, or they end up not saying much at all because they’re not sure HOW to respond. Your heart skips a beat. The excitement kicks in… and then utter panic. This refers back to the ‘no contact’ rule. No contact does not mean ‘ignore’ your ex. It simply means removing availability, and in turn, helps to raise your perceived value. I suggest waiting to respond an hour or two longer than what you would typically take to answer. Keep them on their toes a little! Ahhhh! I see this all too often. An ex-makes contact, you have a great conversation, and you automatically assume your ex wants you back. It does not mean this at all. Often an ex is simply messaging to say hi and see how you are going. At this stage, it doesn’t necessarily mean your ex wants to get back together. When you act cold or short, it comes across as if you are not over the relationship. You may still be emotional or upset, and your ex will probably cut the conversation short because it makes them feel awkward. If you are too enthusiastic, they may not want to continue the conversation, in fear they are giving you the wrong impression and lead you on. Best to avoid either extreme. The last thing you want to do is give your ex the impression you are not doing well. Even if you pretend you are great in text, your ex could call, and it would be hard to hide your emotions. Resulting in an unintended argument or messy conversation. In most cases, your ex is messaging to say hi and see how you are going. Sometimes, they are trying to evoke a reaction, e.g., “are you ignoring me?”. The last thing you want to do is give the impression you are not doing well. So I suggest, before you respond, to get physical! Do some jumping jacks. Run around the block. Share a good belly laugh with a friend. Basically get yourself in a good mood, and feeling grateful for all the beautiful things happening in your life. Expand your knowledge and be prepared! When you feel good, confident, social, kicking goals and prepared, you will automatically come across as happy, confident and super enthusiastic about life. You can honestly respond to your ex with a “Hey! Are you okay? I’m doing really well. I’ve been doing this and that…” and really be excited about it. 3. Keep your messages between 5 – 10 lines and the conversation short. I know this can be tricky. Especially, if you were terrific friends and missed each other a lot. But I highly recommend keeping this initial conversation reasonably short. You want to avoid long texting conversations and move to face-to-face as soon as possible to re-connect that bond. Keep individual messages no more than 10 lines long, and try not to spend more than two-hour texting. 4. Be the one to end the conversation. You don’t need to be rude, just say something like “Hey, I have to run. Maybe we can catch-up sometime properly in person. But right now I have to go”. This is how you keep control of the conversation and keep yourself magnetic to your ex. So your ex will end up wanting to chase you. A great response to an ex when they message out of the blue is all about you! Be energetic, enthusiastic (about your life), and keep it short! Check out my 4 action steps of self-confidence program here. Previous Post: « Can You Stop Loving Someone In One Week?